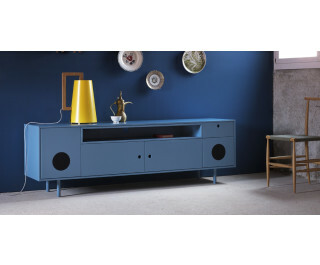 Sideboard which performs the utility of having, integrated to the cabinet, a stereo sound source. The system was developed by an Italian audio lab. E 'can connect the TV, the computer, the iPod, and more. External lacquered in white, black, red, gray silk, pastel blue or gray powder or in walnut or oak sawn combinations, such as images.